A rollercoaster ride on scuba. That’s what one might find when visiting dive sites like Blue Corner in Palau or Cocos Island, Costa Rica, or a handful of other high-voltage diving settings around the globe. 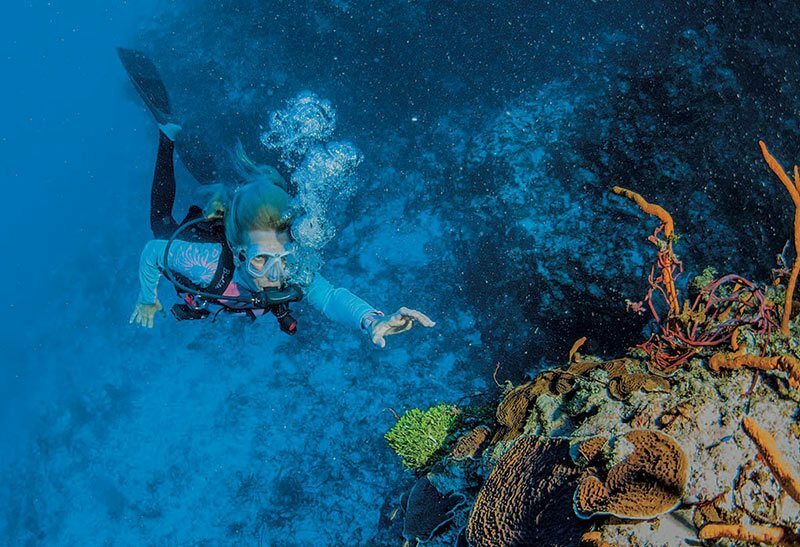 You are guaranteed awesome diving, but also can expect some impressive and challenging currents. Currents are not unusual but ones that propel you up or down, like being on an elevator, can be unnerving. In Open Water scuba class you learned about how to deal with typical horizontal currents. Begin your dive into the current and spend the second third of the adventure drifting back. Adjust your navigation to compensate for a sideways current. You were even taught how to determine when the current is too strong and therefore unsafe to even enter the water. The currents you spent the most time on were those that run parallel with the surface and the bottom. The ones you most likely didn’t learn much about in Open Water training were vertical currents. There are a number of factors that unite to create vertical currents and it is important to know how to identify and react to these uncommon occurrences. Vertical currents typically are encountered along the face of a wall or, as in the case of at least one Cocos Island dive site, where a deep ocean current rushes upward as it intersects a seamount. These upward or downward oceanic rivers also result when two currents converge from opposite directions, creating a strong upward or downward flow. There are two types of vertical currents: those that flow downward from near the surface toward the bottom and those that flow upward from the bottom toward the surface. The downward flow is called a downwelling and the upward flow an upwelling. A downwelling current typically rushes from shallow water over the lip of a wall and surges down the face, forcing deeper everything in its path. 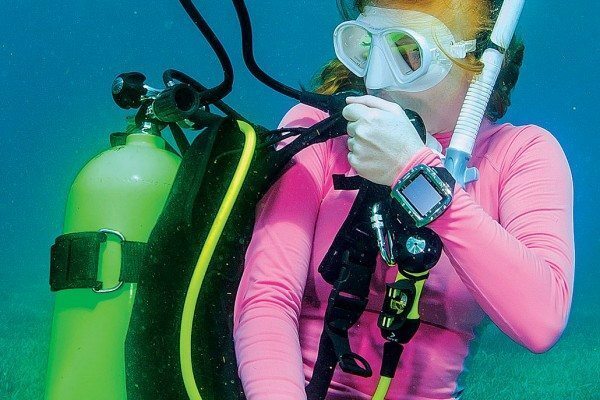 For divers, that’s not good; you can quickly exceed your planned maximum depth, and more. An upwelling, on the other hand, behaves just the opposite and can be even more dangerous; it rushes from depth toward the surface, typically with great force up the front of a wall and over the lip. Venturing into an upwelling’s path can result in an elevator ride to the surface. The speed of the upward force typically far exceeds a safe ascent rate. As you might imagine, vertical currents can be extremely dangerous and staying safe around them demands swift and decisive action. The best way to handle any problem is to solve it before it becomes a problem. In the case of vertical currents, that means avoidance. Vertical currents generally are localized and typically can be avoided if you plan in advance or quickly recognize their presence. 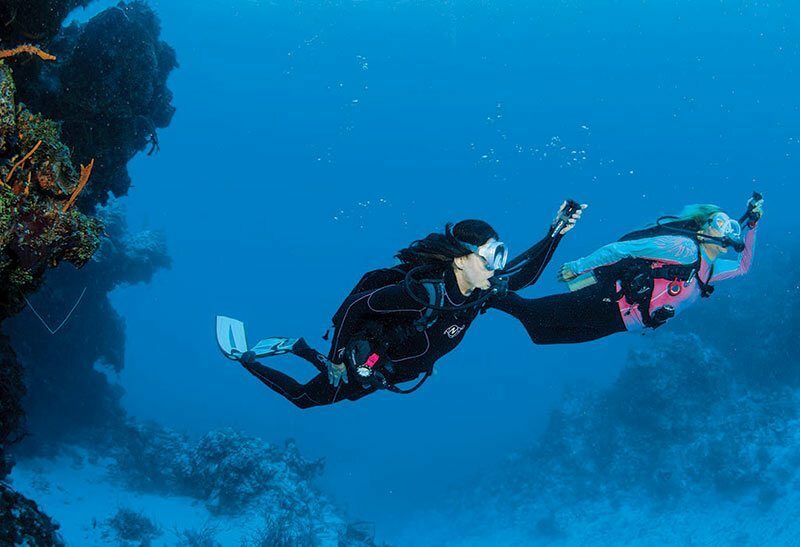 Fortunately the diving at most locations where there is a high probability of vertical currents is conducted by commercial dive operators who are well aware that such currents exist, and take the necessary steps to avoid them. Typically such dives are guided. If not guided, during the dive briefing the divemaster cautions divers of the potential dangers and provides instruction on what to do if vertical currents are encountered. If you are swimming near a wall and feel as if you are being forced upward or downward, immediately reverse course and keep swimming parallel to the wall (Photo One) until the sensation subsides. Then, regroup and devise an alternate plan. Unless the vertical current is mild, do not count on being able to power your way through. [ONE] At the first sign of a vertical current the guide reverses course and directs the divers to safer conditions. If you are exploring a pinnacle and begin to feel as if you are being forced upward or pulled downward, immediately retreat and swim to the opposite side of the pinnacle, if possible. There you should be in the lee of the current and out of danger. Not all vertical currents are predictable. On a trip to Cocos Island, Costa Rica, my group had dived Isla Manuelita several times without incident. However, one afternoon we were adjacent to the pinnacle in the midst of our usual safety stop when a vicious downwelling suddenly tugged us deeper. Those of us who were near the edge of the downward pull were able to swim out of its grasp and free from the threatening undertow. One diver, however, was not so fortunate. Carrying two cameras, as professional photographers sometimes do when diving Cocos Island, and before he could react, he found himself at depths nearing the recreational limit. Being pulled from safety-stop depth to deeper than 100 feet (30 m) in a matter of seconds is a bit disconcerting. Fortunately, even though this was his first encounter with vertical current, this diver was well-trained and had listened closely to the dive briefing. He knew what to do and executed perfectly. These dangerous currents occur when a strong flow of water rushes over the lip of a wall toward the bottom, or a horizontal current strikes a stationary object, like the pinnacle at Isla Manuelita, and rushes down the face. Swift action is demanded. While being pulled deeper there is little time to stop, think and act. Your actions must be instinctive and immediate. Remain calm and immediately increase your buoyancy as you swim upward and away from the current. As described earlier, swim parallel to the wall or seaward away from the wall. 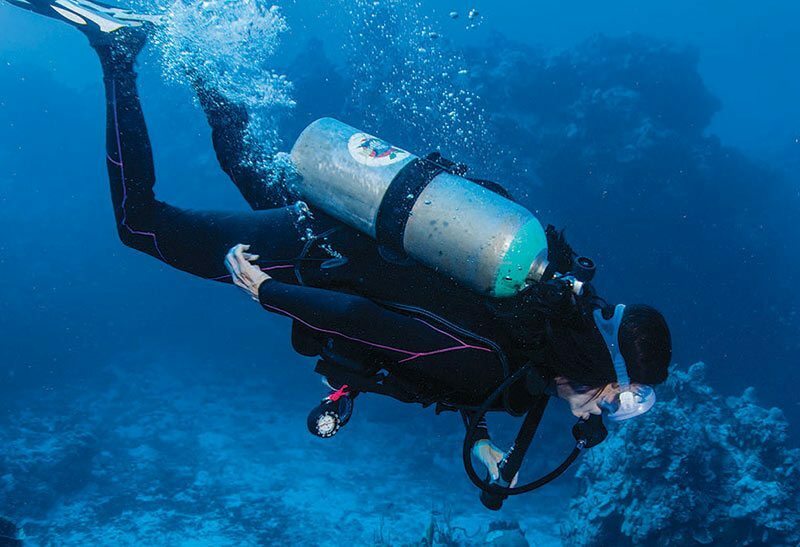 Using either technique, swim diagonally upward at a 45-degree angle while adding air to your buoyancy compensator to counteract the downward force (Photo Two). Don’t hesitate to fill the BC, if necessary; the added buoyancy might be your only hope to avoid being drawn deeper. [TWO] To escape a downwelling, swim diagonally at an upward angle and add air to your buoyancy compensator to increase buoyancy. Once you’ve added air, keep the inflate/deflate mechanism in your hand to immediately vent air in case you suddenly escape the downwelling. If swimming vigorously and increasing your buoyancy does not halt your downward momentum, consider making physical contact with the nearest stationary object, even if it is the wall, and hold on tight, pulling yourself upward if necessary (Photo Three). [THREE] If unable to stop from being forced deeper, make physical contact with the nearest stationary object and pull yourself upward. Your only other choice is to ride out the downward flow. Fortunately, typically the strength of a downwelling current diminishes as it goes deeper. Once it subsides or you escape the downward force, you just need to make a safe ascent. 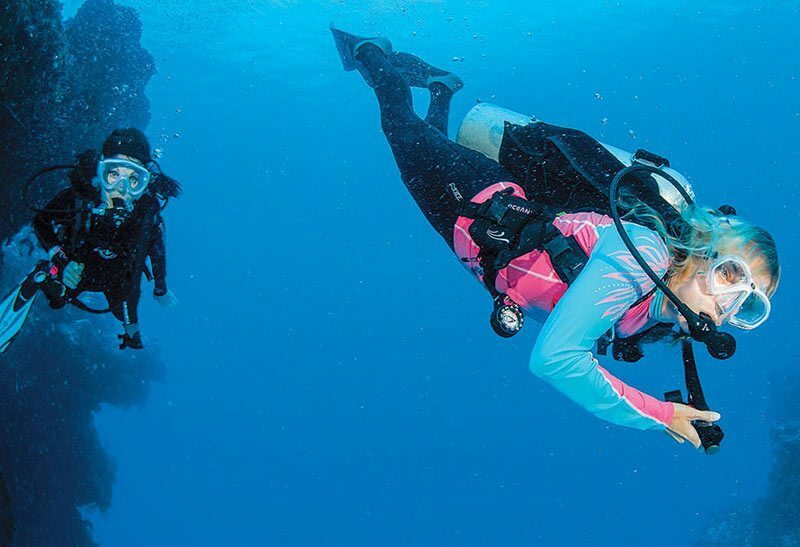 Your dive computer will tell you if mandatory safety stops are required. An upwelling current is the opposite of a downwelling. It flows vertically from deeper to shallower water. 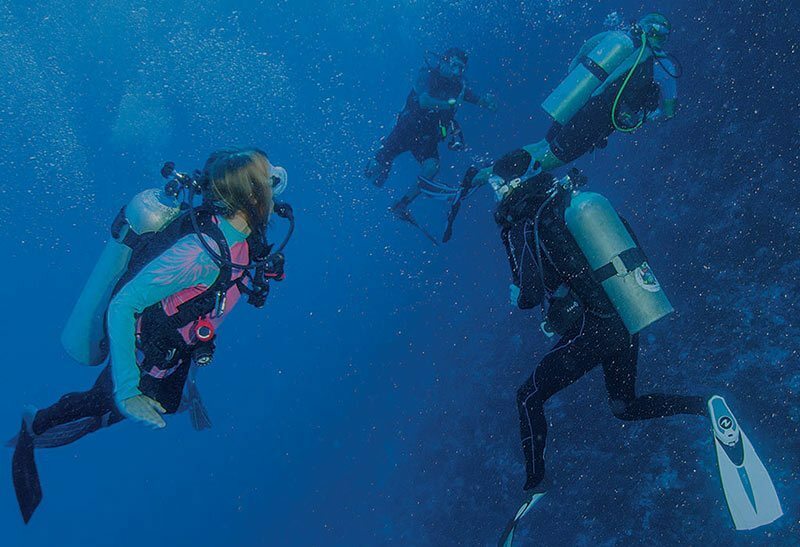 However, getting pushed toward the surface at an unsafe rate of ascent can have immediate medical consequences, mainly decompression sickness and overexpansion concerns. When you feel yourself being pushed toward the surface, remain calm and attempt to escape the vertical current by swimming parallel to the wall or seaward away from the wall. Typically, this will eventually lead you out of the upwelling’s force. [FOUR] To escape an upwelling, swim diagonally downward away from the wall as you vent the air from your BC. Using either technique, swim diagonally downward at a 45-degree angle (Photo Four). At the same time empty the air from your BC; using the bottom rear dump valve, if so equipped, typically is most effective in these head-down circumstances (Photo Five). Continue swimming until you are clear of the upward force. [FIVE] The BC’s bottom dump valve typically is most effective for venting air when in a head-down orientation. Depending on how fast and how shallow you were pushed by the upwelling ride, once you are out of its grasp it may be best to perform a safety stop at that depth, or even descend a few feet and do the same, before making a normal ascent. Either way, pay attention to your physical condition. If you notice any physical signs of having ascended too rapidly, proceed accordingly. Vertical currents are rare, but there are several dive destinations, mostly exotic, where they are sometimes encountered. That is just another reason to dive with a commercial dive operator, or at least research the dive site before you are surprised by dangerous conditions.